Bundesliga | Schalke's Leon Goretzka on his stunning free-kick against Leverkusen: "I said I'd belt it in"
Schalke's Leon Goretzka on his stunning free-kick against Leverkusen: "I said I'd belt it in"
In the end, it wasn't enough to give Schalke the home victory they'd hoped for but Leon Goretzka’s stunning free-kick in Friday's 1-1 draw against Bayer Leverkusen was still a strike to be cherished. Question: How do you assess the draw against Leverkusen? Is it too little for Schalke? Leon Goretzka: It feels like two points dropped. We went in front once again but then we didn’t manage to get the second goal. I obviously have to look at myself there, too. I should have scored in the 56th minute – even when the chance might have looked easier from the stands than it actually was on the pitch. Question: What was so difficult about it, when you hit the ball narrowly over the bar from close range rather than into the net? Goretzka: I'd turned around just before it and lost my bearings a little bit. If I was as cool in front of goal as someone like Guido Burgstaller then I would have just sidefooted the ball home. But I got a little bit hurried even though the chance was easier than the free-kick. What’s really annoying is that in the end we gave the opponent the opportunity, with a lucky, deflected goal, to leave with a point. Question: For the free-kick, it seemed that Leverkusen were surprised that you struck it. There were some other players ready to take it. Was that dummy discussed beforehand? 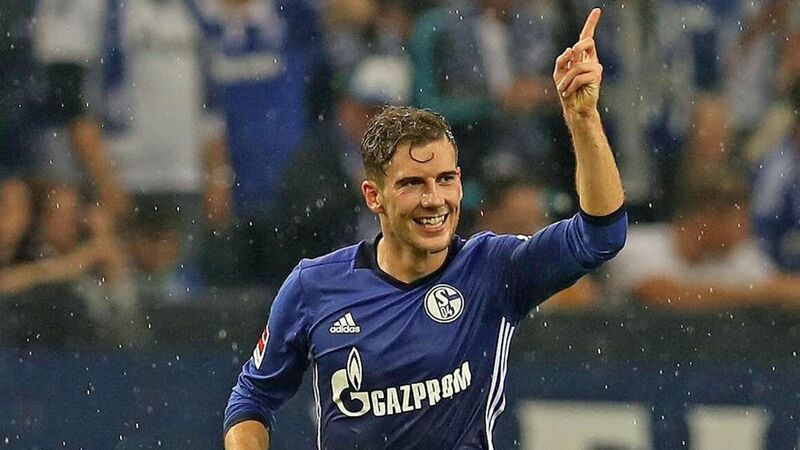 Goretzka: I have to admit that there was a little discussion about who would hit it. During the week we had spent some time in training working on free-kicks. And there were several players who did very well. When we get another couple of free-kicks this season I won’t be worried. A lot of goals were scored [in training] so it was difficult to choose who the taker would be against Leverkusen. I have to thank Naldo, who was very involved in the discussion and said that I could hit it. But I also really insisted that I could do it. I said that I’d belt it in. It was nice that it worked out and that we were rewarded for it. Question: This season Schalke are noticeably stronger than they were last season in set-piece situations. Is that all down to work on the training ground? Goretzka: We definitely have players that are strong in the air from corners and we also have players who can deliver set pieces very accurately. So I’m puzzled that last season we did so little with them. We obviously work on set pieces at training but we did that in pre-season as well. In that sense I don’t know if it’s down to training. But it’s definitely nice that it’s already starting to get noticed. Question: With what feeling are you going into the international break? Goretzka: Ten points from seven games doesn’t sound so great, but you can put that into perspective a little bit when you look at who we have played against. It’s been a challenging start to the season. And we’ve always emphasised that what’s most important to us is how the development of the team is going. Against Leverkusen we once again took a step forward in this respect. Question: What do you mean by that exactly? Goretzka: We’re implementing the coach's plan. In the week before the game we addressed areas where we wanted to do better. We admittedly didn’t do that well in the initial phase when Leverkusen managed to push us back. And the Tedesco style is not only about playing on the counter – we want to have a lot more control of the game. We did that to good effect against Hoffenheim [on Matchday 6] and also after the first quarter of an hour against Leverkusen. We carved out chances that we’ll simply have to take in the future. If we score the second goal here at home, Leverkusen wouldn't have come back. Question: What do Schalke have to work on now? What’s missing at the moment? Goretzka: We can still improve in every area – that’s what the last two games have shown. We put in a very good performance but didn’t get what we deserved. Nevertheless it’s good that we are at least going into the international break with a point following the two defeats against Bayern Munich and Hoffenheim.